Delusions, it has been noted, begin early and spread widely. And now they're being spread again. Trifling, beggarly, scant, meager, miserely, piddling...take your pick...choose your adjective...just make sure it is synonymous with plebeian, because that is what the biggest loudmouth intellectuals on the market are telling us will be the returns for stock investors for 2010. The same intellectuals that touted the Depression last year. No one learned last year's lesson? What happened to all those Depression stories? Or the Depression books checked out at the libraries? The books are back on the shelves! Google "depression" and now you'll get a prescription! And along with the Depression came the tribulations of Armageddon! What happened to that? Now there's not even a peep or a reference to their folly! So now, this year we have the Great Delusion. The delusion of the bears. And once again, they're following the script of the 666 market. They're trotting out the Great Delusion before its time! And for those not versed in biblical eschatology, the Great Delusion (Daniel 9:27, 11:31 Matthew 24) is the Abomination of Desolation. In 167 BC Antiochus Epiphanies set up an altar to Zeus over the altar of burnt offerings in the Temple at Jerusalem, and sacrificed a pig over it. 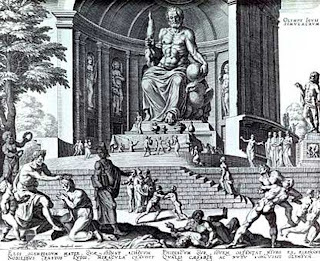 (the drawing above is Zeus at Olympia 250 years before that) In the End Times, the Anti-Christ, known as the Man of Lawlessness makes a 7 year pact with Israel, and then halfway through, he tries to establish himself as God. The end of that Great Tribulation was what Wall Street told us we would get last year--Armageddon! Since they missed the Great Depression and Armageddon, they're now back to the prequel of the sequel--the Great Delusion! So why aren't they fleeing to the mountains? Maybe they don't believe what they preach! John Etzler had his "perpetual energy" machine--his own great delusion. The bears took it and turned it perpetually bearish! And once again, their timing is off! Bull markets average over 42 months. We're only in month ten! Can't they even choose an analogy, that has a trifling, or a piddling, or a scant,or at least a miserly similarity to what they are touting? I guess they just want to live in their own Great Delusion! This economy, and this stock market, will reward the most outlandish bull, and the most bullish economic forecasts. It's not a market, or an economy for the timid....Today, this strategy will be known as reckless. Next year, it will be deemed prescient. Recklessness left and prescient walked in the door! Now that's the Reader's Digest version, but if you wanted the Christmas version, it's here. I put it out on Christmas Day, because it was another market gift. Same with this piece titled He is Risen on Easter. See if that was right, while everyone quoted on it was wrong! You get gifts on Holidays! Last year the bears were so wrong, to me it looks like they chased the witches from Scotland in the 15th Century, from Essex in the 16th Century, and England's Jane Wenham from the 17th Century over to Wall Street! And these seers were just as phony as the witches they burned at the stake. But with these bears, all we had left was just a witch's milking stool! Wait--didn't we have the milking stool, on this blog, on the day of the second leg up in this market? Touting the next leg up? And unlike Jane Wenham, no-one had to recite the Lord's Prayer to know if they were guilty of willful ignorance! So excuse the Sybiliian rant, but in honor of her 16 personalities, I'll cover her head--but then, wouldn't that be a "Shockingly bad hat?" (Excuse the reference to Extraordinary Popular Delusions and the Madness of Crowds) but if you read that book, (that's just one of the popular follies of the great cities) which really is Wall Street's treatise on the history of mass psychology, even though it was penned in 1841, (for perspective's sake just two years before Dicken's A Christmas Carol), but the endorsement by financier, and confidant of Presidents, Bernard Baruch in 1932 put it on Wall Street's bookshelves. 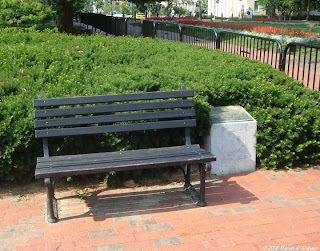 Heck, you can read the book on Baruch Bench in Lafayette Park across from the White House! "Baruch's faith helped him make his fortune. During his Wall Street days, Baruch sold short, to the limit of his resources, a stock he believed to be overvalued. He expected a quick profit on the next business day, believing the directors would not declare the regular dividend since the company could not afford it. He knew, however, that if the directors bluffed and declared a dividend, the stock could rise, and he would have to cover instantly or lose everything. The day before the dividend declaration day, his mother reminded him that the next day was the Jewish holiday Yom Kippur, and he had promised to maintain the solemnity of the annual occasion and "keep" the holiday holy. Keeping his promise, Baruch ignored the multiple phone calls and telegrams from his friends who urged him to take his profit and cover. After Yom Kippur had passed, he read the telegrams and learned that, indeed, the dividend had passed. Rather than rising as a result, however, the stock had fallen precipitously. Keeping his promise, he had become a millionaire." 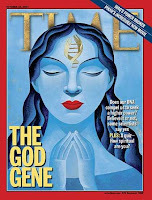 They say those that have a susceptibility to spiritual ideas or beliefs have the VMAT2 gene, popularly known as the "God gene." But is hard wired genetic behavior right? An example given of genetic behavior in the DNA of Healing is the young 5 year old daughter asking her Mother why her ham is so delicious. Her Mother explains how she cooks it, and the seasoning, but then her daughter asks why she cuts the ends of the ham off. Her mom says "I don't know, why don't you ask your Grandma--she's here." Since Grandma is there, they ask her. She says, ask Great Grandma--"she's here, and I learned from her." So Great Grandma waddles over, and explains the cooking of the ham, the seasoning, and then the girl asks her, "But Great -Grandma, why do you cut the ends off of the ham?" She says, "Well honey, I never had a pan big enough to fit the ham into." And that's as close as Wall Street is going to get to the roasted pig and their Great Delusion! But the point is, sometimes a strong belief, changes the hard wiring you have from generations of thought. And good or bad, your DNA records it. I don't play poker, because I can't keep a straight face, but I spend some time at casinos, because I like the action, and I have a fairly good short term "flash memory" retention of cards that are laid out on a table and know when the odds shift in your favor. But that's a different game than poker. If you play poker, a good player wants to play with other good poker players because then they know the "rules" that they are up against, and generally how the hands will be played. It's the same with stock market. You have to know your players! Being right on your thesis but being wrong on the stock price, means your thesis meant nothing. You can complain all you want about Government intervention in the marketplace, but they're playing at the table with you, so you have to adapt your rules to them----You have to look at your hand through Wall Street's prism. And then when markets bluff; you just have to call Wall Street when it does. And learn from Bernard Baruch! Because this year's Abomination of Desolation is just last year's Armageddon. Just another Great Delusion, cooked up by the bears! Palmoni I spent a whole day trying to understand this post, so after a lot of work and Google I have come to just one conclusion. But its so brilliant, nobody will understand the message unless they spend hours understanding it. You took two completely different viewpoints 1)the delusion of bears who think the world is going to end, with 2)the writer of the book The Great Delusion, who believed in Utopia, and then contrasted the viewpoints, without telling readers you compared them. You then took compared Zeus, who sacrificed a pig, with a Great Grandmother who cooked a ham, while talking about the defects in DNA. I checked up on Jane Wenham. 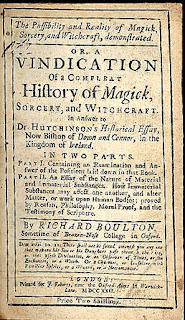 She was a witch, who was accused of being a witch because she didn't say the Lord's Prayer correctly. I studied the Lord's Prayer. It was mentioned by Christ, who taught his disciples to pray the Lord's Prayer, and not to do it to be seen-the very act which they accused Jane Wenham of. You then compared this, with Pilate asking Christ, "What is truth?" The answer from Christ? No answer. A perfect contrast again. And the Lord's Prayer, is the prayer said over Easter-at least according to Wikipedia. You gave the Christians Easter and the Jews Yom Kippur, but you did it with Bernard Baruch, the most conservative of investors, whose sensibility will offend no-one. And I researched the abomination of desolation. I assume you believe that the prophecy was written in Daniel, hundreds of years before it was fulfilled the first time. I also found out, that secularists believe the prophecy was written only after it happened, because it was so accurate. And that, was how you patted yourself on the back for your predictions that came true. After all, your summary post on your blog made on January 1 was unbelievable. No one has ever (in my experience) had such accurate predictions before. Bravo! But do you realize that most people will never "get" what you write? Why don't you explain yourself more? If you did, people would appreciate what you write, much more. One more question. How do you bring all these unrelated subjects into a cohesive whole? When one need church loan for church construction against a church property,this segment is called church mortgage and finance.It's charged by Griffin's Church Loans only during construction and the rate is very fair which is actually a great offer for those who need church loan for church construction.